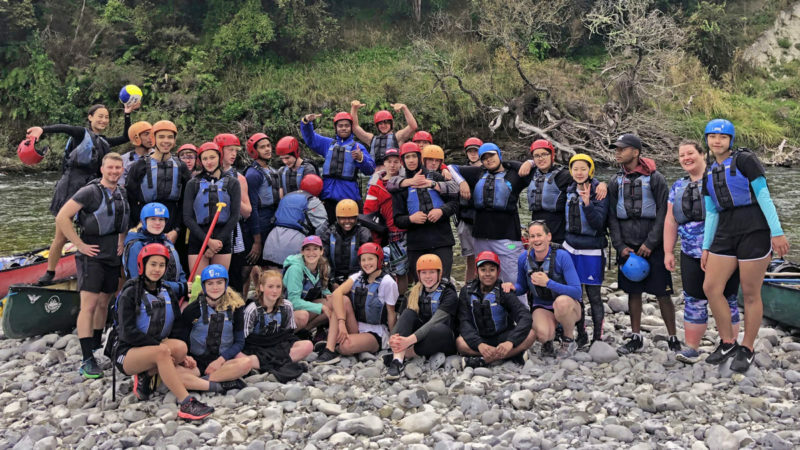 Over the 6th and 7th of March, the senior PE students from Year 11, 12 and 13 attended the Rangitikei River Canoe trip. The aim of the trip was for students to paddle their way down the Rangitikei River in 2 man canoes for two days. The aim of the trip was for students to complete their NCEA risk achievement standards, along with this experience a multi-day canoe trip. We entered the river just south of Taihape where students were to taught how to steer the boats, how to manoeuvre through rapids and most importantly what to do if they fell out. Students also loaded all their gear for two days into barrels that were then strapped into the middle of their boats. Gear included all their clothing, cooking equipment, food and tents. After 7 hours of paddling on the river and plenty of learning experiences, especially through the rapids, we arrived at our camp spot for the night in Mangaweka. Students set up tents and cooked their yummy dinner on single gas cookers. On day two, after packing up our campsite, we hit the river again. It was much cooler this morning and plenty of mist over the water. With a shorter day, there was lots of time to stop and swim. After 5 hours on the river, we arrived at our pull out point in Ohingaiti. The students had to work as a group and support each other over this trip and it was excellent to see all students step and up and be part of the team. Amazing memories were made.